Besides trying to win your office bracket pool or rooting for your alma mater, the most exciting part of the NCAA Men's Basketball Tournament may be seeing which underdog will pull off a major upset. Trying to come up with a top 10 list of the biggest upsets in history is always somewhat subjective. We compiled this ranking based on numerous other lists. 10. In 1991, defending national champion and undefeated UNLV was riding a 45-game winning streak. At the Final Four, they were beaten by Duke 79-77. It would mark the start of Duke's run as a powerhouse program as the Blue Devils went on to win the first of its five national championships. 9. Florida Gulf Coast will always be able to say it was the first. In 2013, the No. 15-seeded Eagles upset 2nd-seeded Georgetown in the first round, then upset 7-seed San Diego State. The Eagles became the first 15-seed to reach the Sweet 16. They also pulled it off in their first tournament appearance. 8. Ivy League schools don't get much love during the tournament, but the 9th-seeded Quakers made some big-time noise by upsetting the No. 1 seed North Carolina Tar Heels, 72-71, in the second round of the 1979 tournament. Penn won their next two games to reach the Final Four. 7. Duke fans don't ever expect their team to reach anything less than the Sweet 16 appearance. In 2012, 15th-seeded Lehigh put that to bed by knocking off the No. 2-seed Blue Devils 75-70 in the first round. 6. As an 11-seed, the George Mason Patriots had an uphill battle from the start in 2006. But they pushed through higher-seeded foes in the first three rounds and then upset top-seeded UConn 86-84 to advance to the Final Four where they lost to eventual national champion Florida. 5. Richmond was the first No. 15 seed to ever win an NCAA tournament game. In 1991, the Spiders upended No. 2 Syracuse in the first round 73-69. 4. No, they weren't the first No. 15 seed to pull off a first-round win, but when you dominate a Tom Izzo-coached Michigan State team in the opening round, that's saying something. In 2016, Middle Tennessee State got out to a 15-2 lead and never trailed, beating the No. 2-seed Spartans 90-81. 3. Longtime basketball fans know this one all too well as North Carolina State defeated Houston's "Phi Slama Jama" 54-52 to win the 1983 national championship. Dereck Whittenburg's desperation 30-foot three-pointer in the final seconds was going to be short, but Lorenzo Charles was there to grab the ball and dunk it home as time expired. 2. Villanova picked up its first national championship in 1985. After fighting through the Southeast region as the No. 8 seed, beating higher-seeded teams almost the entire way, the Wildcats upended No. 1 Georgetown 66-64 for the title. 1. No. 16 seeds were 0-135 in the NCAA Tournament until 2018. 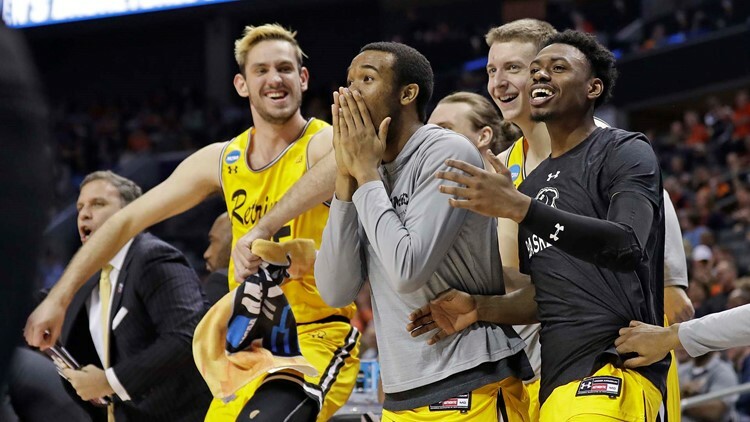 That's when University of Maryland-Baltimore County busted every bracket with a crushing 74-54 win over the No. 1-seeded Virginia Cavaliers. The game was tied at the half, then the Retrievers outscored Virginia by 20 in the second half.